The stakes were high for both teams heading into Friday night’s clash at Campbelltown Stadium. Following on from their shock loss to the Dragons in Round 1, the Broncos were clearly keen to build on their renewed momentum in the wake of their win over the Cowboys at Suncorp Stadium last week. Conversely, if the Tigers could manage to bring home a third win, it would cement everything that has felt significant about their football year so far, and focused about Cleary’s coaching. 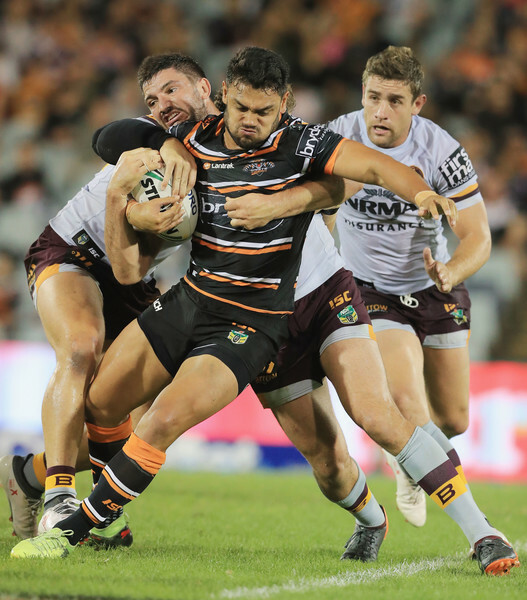 In many ways, the first stanza was a continuation of that Wests Tigers momentum, since while the score may have been level at 2-2 thanks to two penalty goals – the first early on from Jamayne Isaako, the second later in the piece from Esan Marsters – this marked the fifth half of football in 2017 in which the boys in black and gold have managed to keep the opposition down to a try or less. Given that Jack Bird was making his debut in Broncos colours, that was an even more impressive statistic, especially in tandem with the cascade of penalties and errors that plagued each side. The Broncos were the first to put down points, after a shove from Matt Eisenhuth on Anthony Milford gave Isaako the opportunities to kick for two. From there, Brisbane enjoyed an escalaying sequence of possession and field position – and the Tigers bled penalties – only for Josh McGuire to lose the ball, and Luke Brooks to then lose it just as quickly, thanks to a high pass that hit Chris Lawrence on the shoulder and then richocheted forward just as the hosts were starting to glimpse a bit of space. It was to be the beginning of a series of messy, sudden and unexpected changeovers, as well as some uncharacteristically spotty playing from both sides mixed with moments of equally inspired brilliance. The nadir came towards the end of the stanza, when the Campbelltown army put in what has to be a contender for the worst set of six ever committed to first-grade footy – a series of bounces and aborted, awkward passes that looked a bit like rugby league crossed with basketball. Before that point, however, there was no small share of drama, with Malakai Watene Zelezniak putting in a massive tackle on James Roberts about fifteen minutes in to prevent him picking up an offload from Isaako, only to sustain an injury in the process – his second of the night – that saw him sent off the field. Combined with Dallin’s revelation about his jaw injury, that makes for a bit of a quiet few weeks for the Watene Zelezniak brothers, in the first injury of a fairly injury-laden game. The Tigers made up for it, though, with Benji, in particular, showcasing the leadership that has made him so much of an asset over the last couple of weeks – perhaps more than even the most faithful Wests fans could ever have thought possible. Cleaning up what could have been a trymaking grubber from Milford, Benji managed to defuse his old team’s momentum perfectly and to remain in the field of play to boot, with a penalty on Pangai Junior for a sloppy play-the-ball turning the tide further in the Tigers’ favour a couple of sets after Benji’s magical movement. From there, Brooks put in two fifth-tackle kicks in quick succession, the first of which bounced off the post and forced and error from the Broncos, the second of which – shortly after – deflected off the Brisbane defence and skidded over the sideline. Despite the on-field call, Kodi Nikorima had clearly played at the Steeden, but the Broncos resumed possession, only for Bird to lose control of the footy on the third tackle of the subsequent set, galvanising the Tigers into a burst of momentum that culminating with a brilliant kick return from Corey Thompson a couple of sets later, in which the ex-Viking made it all the way back to the forty with speed and dexterity. To make things worse for the Broncos, Corey Oates was the next to go down with an injury, with Tom Opacic subbing in as the Origin representative was taken off the field, punching the side of the corridor in frustration at his oremature exit. Sometimes when neither team manages to score a try soon enough both of their attention falters, and in the wake of Oates’ exit both the Tigers and the Broncos started to grow sloppy, with Thompson leaving the field for an HIA and Naiqama shifting to fullback, in yet another of the reconfigurations that plagued the game. Five minutes out from the break, Milford chose to break a Broncos set play and run the footy. He may have been blasted by Darius Boyd, but Boyd himself lost the ball shortly after, as it felt as if half time couldn’t come soon enough for both teams, if only because it was only a matter of time before one of them was going to come up with a blunder or messy play as bad as what we’d glimpsed with that aborted Tigers set, which will surely occupy pride of place in bloopers reels for decades to come. The players returned from the sheds with a new focus and energy – clearly determined to put down a try at whatever cost. As it turned out, however, neither team could quite make it – at least not initially – with Brooks sending through a deft grubber that didn’t quite manage to sit up in the right place for Thomspon, and Bird chasing down a Brisbane kick only to knock it on. The Bird putdown was especially suspenseful, as the ex-Shark reached out a finger to just grace the Steeden, coming about as close to a grounding as possible while not quite getting the footy to ground. So difficult had it been for either side to score four-points that it started to look as if we might be set for golden point – with a scoreline of 2-2 – only for Michael Chee Kam to break the drought at the 52nd minute. Given that the Tigers had scored both of their 2018 tries – from Thompson and then Brooks – at the 77th minute, this felt like a critical evolution in their attacking game in a season in which so much of their brilliance has depended upon restoring their reputation for rigorous defensive flair. The try was all the more impressive in that it didn’t depend on any particularly special play – just a well-weighted kick from Brooks that Chee Kam gathered to his chest, somersaulting over into the in-goal area under the pressure of a massive tackle from Isaako. In slow-motion, you could see Boyd stick out a boot and try to deflect the footy much as Nikorima had shortly before, but to no avail, and with Matulino having been responsible for the play-the-ball this felt like a critical moment in the Tigers’ cohesion and convergence of their new and old talent across 2018. With Marsters failing to make the conversion, we were back to a two-point game, as the Tigers set their sights on a potential historic victory over the Broncos, who they’ve never yet beaten at Campbelltown. Over the next ten minutes Brisbane came close to putting down points, with Roberts smashing over in the corner only to be called back from an obstruction, and Boyd sending out a pass to Opacic that Oates might have been able to put down, but that the ex-Dolphin was forced to slam into touch following on from the trysaving tackle of the night from David Nofoaluma. With ten minutes to go, the Tigers were dealt another injury blow as Benji fell to the grass clutching his leg in pain. For a moment the team were in freefall, as it became unclear whether or not Benji was going to leave the field, but despite Ivan Cleary’s instructions he insisted on having his leg strapped and staying on. It was the beginning of what would be the gutsiest period of the game for the Tigers, with Russell Packer putting in an enormous move on Milford with nine minutes left on clock to return possession to his side and allow them to clock up more momentum. From there, things got almost unbearably suspenseful, with the Broncos receiving a penalty five minutes out and Isaako choosing to take the two to level the score, putting in a terrific kick from the side of the field and then adding a field goal shortly after to bring the Broncos to 7-6. 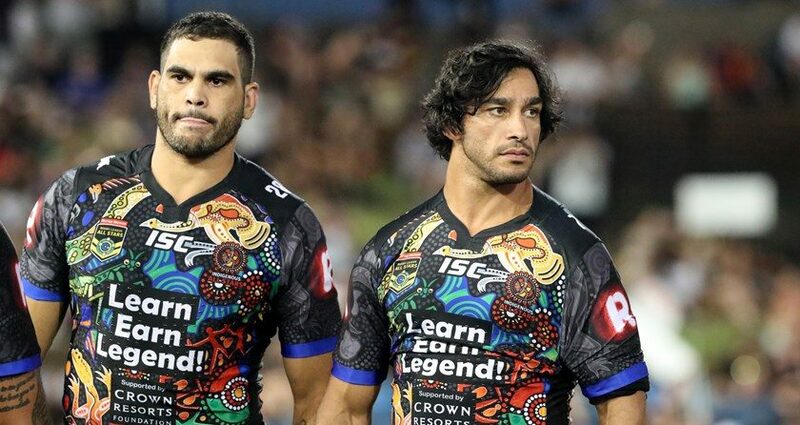 For the first time in their history, Brisbane looked set to win without scoring a single try, while Isaako was beaming after having put down every point for the team in only his first handful of first grade NRL games. As if that wasn’t dramatic enough, MWZ – who had returned to the field – managed to pop the Steeden back into the field of play following a short dropout from the Broncos, setting up Brooks to level the score again with his own field goal with 37 seconds left onto the clock. Heading into golden point with only three tries to their name over the 2018 season so far – and with the Broncos not having even scored a try – the Tigers steeled themselves as the Campbelltown crowd went totally wild for the first golden point they’d got to witness live since all the way back in 2007. Two times in the first five minutes Milford tried to go for the field goal, and twice he didn’t make it. The first time, at the start, he didn’t get in place in time, with Thompson perfectly scooping up the fifth tackle kick. The first time, two seconds from the end, he hooked it to the left, leaving the score at 7-7 heading into the second half of golden point, and leaving open the possibility of the first 7-7 draw in twenty-seven years, since Round 5 1991. At the beginning of the second half it was Isaako who went for the kick, hooking it off much as Milford had done before him. In one of the worst refereeing decisions – perhaps the worst – of the 2018 season so far, however, Ashley Klein called a penalty for the Wests Tigers markers not being square, despite the fact that Brisbane had arguably been erroneous in their player positioning around Isaako’s field goal attempt. While it might have been inspirational to see the Brisbane young gun slot the Steeden through the posts and put down every point for the team, it was too important a moment for a bad refereeing decision, resulting in a loss that was harder to take than usual for Wests Tigers fans, especially given how spectacularly they’d kept the Broncos out up until this point.